Good morning! It’s hard to believe how quickly the summer’s flying by, isn’t it? Today is quick-write day, and your guest author is Heidi Schulz, who likes to tell people that she lies to children for fun and profit. 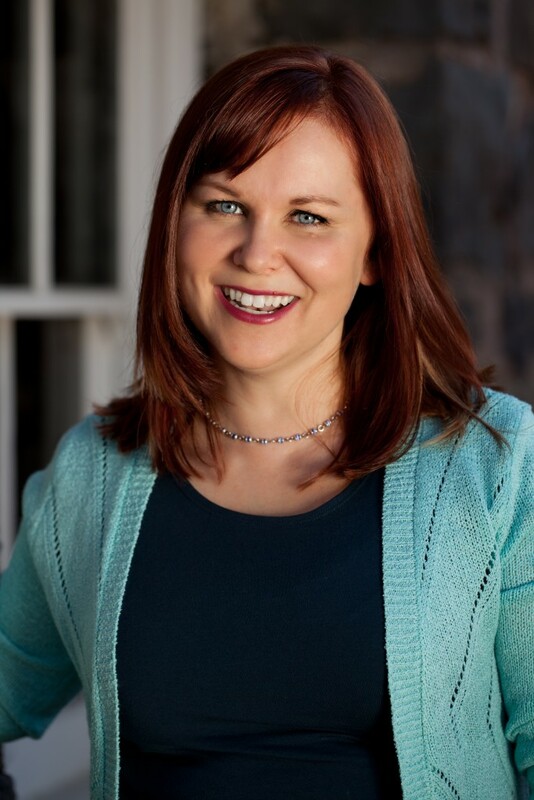 Heidi is the author of the New York Times Bestselling Hook’s Revenge, and a sequel, Hook’s Revenge: The Pirate Code, published by Disney-Hyperion. 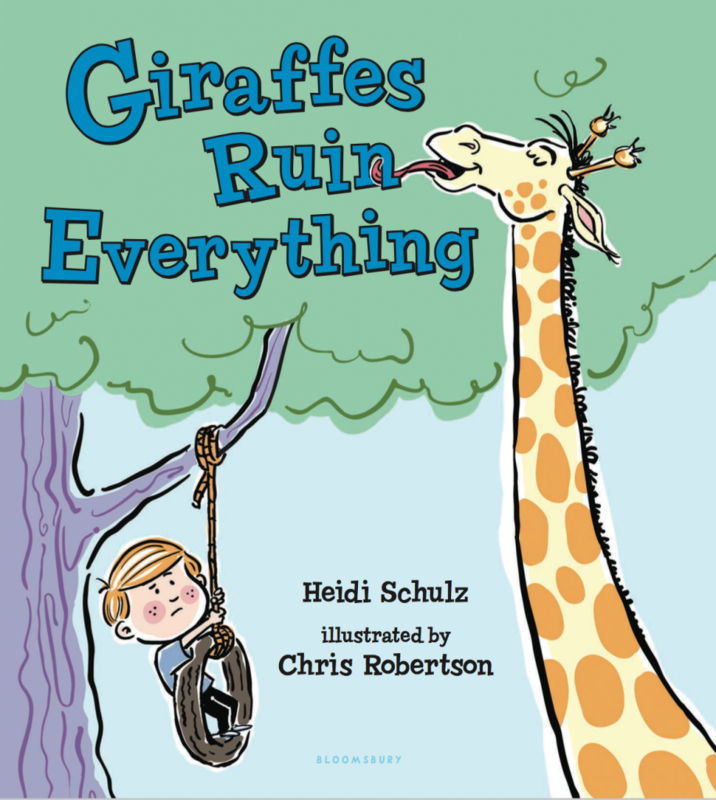 Bloomsbury Kids will publish her picture book debut, Giraffes Ruin Everything, in August. Today’s challenge from Heidi? Be funny! Want to have a humorless conversation? Start trying to analyze why something is funny. Humor likes to shrivel up and die from close examination. But that’s okay! We can still learn a lot from its corpse. What makes something funny, anyway? Think about the last time you laughed—not one of those courtesy chuckles, but a true, deep, belly laugh. Odds are the thing you were responding to came as a surprise. Truly funny things are often unexpected. As you are writing humor, think about what might surprise and delight your reader. Humor engenders sympathy. It breaks down barriers. It opens the gateway to other emotions. When I teach humor workshops I often ask if participants have seen the movie Guardians of the Galaxy, and if so, which characters got the most laughs. Everyone agrees Rocket and Groot, right? Then I ask, which characters made you tear up, get a lump in your throat, or elicited some such emotional response? Once again, Rocket and Groot are the big winners here. I don’t think that’s a coincidence. Laughing with a character is a bonding experience, which is why I feel it’s important, even in serious books. Still not sure? Take a look at Melinda Sordino in Laurie Halse Anderson’s Speak and Doug Swieteck in Gary D. Schmidt’s Okay for Now. Try to imagine how those stories would be different if not for the delightfully clever and humorous voices of those narrators. We are able to connect more deeply with those characters, even in the midst of their pain, because humor makes it feel safer to do so. As a result, we feel everything more deeply. But, I’m not a naturally funny person! That’s okay! You don’t have to be able to tell jokes or make people pee their pants laughing over cocktail conversation order to write humor. Maybe your humor doesn’t blossom on command, but writing is a slow, meditative process. You can take your time with it. If you have ever laughed at something, you understand humor. Don’t shy away from trying just because you have never been the class clown. Perhaps all you need are a few new tools and some practice. Groupings of three feel more complete, more pleasing to readers. They are also more humorous. Just be sure not to bury your punch line. If I change the order of the example below so that the funny part is in the middle it becomes far less effective. Altered: I imagined skipping over there and asking if anyone would like to trade places. They could be hunted down by a maniac in a blue Crown Victoria. I’d offer to play goalie. Not as good, is it? Make sure you end with the joke, and then build in a beat, perhaps by ending the paragraph, or even adding in a scene or chapter break. That rest will help give emphasis to the last line—the funny part. Specificities are funnier than generalities. In the example below, the size, breed, and name of the animal is far more humorous than if it just read “dog.” Read the sentence aloud both ways and see what I mean. Try being specific. Is your character eating “cereal” or “Sugar-Frosted Honey Nuggets?” Look for areas where details such as this will add to the humor and voice of your work. Hyperbole is specificity exaggerated, and it can be used to great comedic effect. Read through your work, looking for areas you might be able to exaggerate. I’ll bet there are a billion of them. Incongruity is unexpected. It’s surprising. And it’s really funny. Ask yourself, “What is the polar opposite of what is currently happening in this scene?”—for example, Heavy Metal Mondays at your local Teavana shop, or vicious attack chickens—then see if you can incorporate it. Like every other bit of writing, revision is where your humorous bits are going to start to shine. You may rewrite a joke or funny scene ten times, or more, before you get it right. That’s okay! Keep at it. Ask your critique partners to highlight anything they found funny. If they didn’t get the joke you were going for, try reframing or replacing it with something else. Unlike a stand-up comedian who has one shot for a joke to land or bomb, unless you are writing in front of a live audience, you have the chance to refine as much as you need. In the meantime, start paying attention to what makes you laugh. Can you emulate what the creator did to elicit that response from you? Today’s assignment: Think of an everyday activity, such as: making breakfast, getting the mail, brushing your teeth, walking the dog, etc. and turn that activity into an extreme sport. Write a paragraph or two from the point of view of a sports commentator, using the rule of three, specificity, hyperbole, incongruity, and/or reversal of expectations to add humor. On your mark. Get set. GO BE HILARIOUS! And then come back and share some laughs in the comments! Mike: She’s coming up the stairs, ready to go. Her dog Ronon seems more awake than she does. He’s pulling on the leash. Joe: Our runners today are Rachel, a middle-aged stay at home mom, and her Irish setter/retriever mix Ronon, they say he is six, but I don’t believe it. Mike: Acts more like a two year old. I’ve seen it in Setters before. It’s the red hair, makes ‘em crazy. Joe: Okay, their doing their warm up walk up the road. They won’t start running till they get to Brookline Ave.
Mike: Walk? That dog is not walking. He’s pulling her towards the telephone pole. And, there it is! The first mark! That was quicker than yesterday Joe! Joe: You’re right Mike, Ronon is quick off the gate. Ready to mark every tree, bush and blade of grass. Mike: There they go, Rachel’s given Ronon the cue and started running. Woah, what’s happening? Ronon is sprinting! Rachel is trying to reign him in. What does he see? A squirrel maybe? Joe: I can’t tell Mike. Rachel is struggling to keep him under control. He’s pulling towards the side. Nope, can’t see a squirrel. Actually, I don’t see anything. Mike: He’s really interested in that tree Joe, are you sure you can’t see a squirrel from your angle. Joe: I’m pretty sure there’s nothing there. But you know Ronon, when he thinks there’s a squirrel, there must have been a squirrel. Mike: Okay, they’re on their way again. Ronon has controlled himself and is running slightly ahead of Rachel. They are rounding the corner towards Washington Street. Joe: Oh no, a dog barked as they past that house. That has thrown Ronon off his run and now he has to… there it is, the second mark! Mike: Well Joe, there hasn’t been much running going on here. Joe: No Mike, but it’s early yet. Rachel needs to reign Ronon in and get him to focus on running. Mike: She’s trying to employ the heel method, without much success. Joe: I see that Mike, Ronon keeps bumping into her at the knees and throwing her off balance. Now she’s letting him pace ahead of her a bit. They are coming up on a cross walk. Let’s see if Ronon darts out into traffic or listens and waits for Rachel’s signal. Mike: It’s early though Joe, there’s not much traffic at this time of day. Joe: I do see a truck coming. Looks like Rachel is waiting to see if it stops for them. Mike: Wow, Joe, the truck stops! That’s unusual for drivers this time of day. Rachel has signaled to Ronon and they are off on their run. It looks like they have a beautiful morning. We’ll see them when they get back. Rachel – Thanks for sharing your exercise! I really enjoyed it! Well, it had me laughing! Well done. Good question about sarcastic humor. I tend to have a more subversive, wry bent to my humor as well. I think the key here is knowing your characters. If your character has a sarcastic, wry best, that kind of humor is going to sound natural from them. See again, for example, Melinda Sordino from Laurie Halse Anderson’s Speak. That biting tone completely fits her personality. However, if that kind of humor doesn’t feel like it fits your character, perhaps spend some time reflecting on how you can recast to better fit their voice. I loved your writing exercise. I have only a twenty pound terrier, but walking her often feels like an extreme sport. I really chuckled at your use of “mark.” Great wordplay! One suggestion: See if you could exaggerate more and make this really over the top. Perhaps Ronan could see a squirrel and take off running after it, pulling Rachel off her feet or casing her to “blow a tire” (lose a shoe)? How outrageous could you get? Play with that. Thanks for sharing, Rachel! I could picture it. It’s so cool to see you here today. Thanks for coming. I love the positive and humorous presence you are on facebook and twitter. Your tweets never fail to make me smile or lol. I echo Rachel’s question about running to the sarcastic or what I call snarky. I enjoy making people laugh in conversation. But, you know, it’s always going up to that line and ALMOST crossing it. You can tell pretty quickly when you are face to face with people….and even on the phone when you have crossed it. However, in writing….you just never know when it really is funny….or if you’ve crossed the line. A day or two ago you tweeted about going to a concert with your daughter and how the day after you just wanted to take a nap. The end of your tweet was NEWSFLASH I AM OLD. I chuckled at that because I’m a mom of teens and I soooooooooooooooooooooo know what that feels like. And, because I follow your tweets I feel like I kinda know you. However, I’m SURE you don’t feel like you know me. OH SWEETIE….THIS IS NOT A NEWS FLASH TO ANYONE BUT YOU. Because it was a knee-jerk funny response to your tweet. AND, it’s what I feel about MYSELF. But I didn’t send it. What if it insulted you? I mean, we don’t know each other. I don’t really know where your “line” is. See what I mean? I’m really riffing on Rachel’s earlier question here. Where do you go to make sure your funnies are funnies that are OK? I’d love to know your thoughts and the thoughts of other authors on this. Because, the very last thing I ever, ever intend to do is hurt someone in anyway with writing. The thought that I could/might/have shuts me down faster than any crit from a crit partner. Thanks again for being here. I am learning so much this summer. Hi Linda! So great to see you here. I spoke a bit about this in answering Rachel’s question when I spoke about knowing your character, but I think it’s important to know your audience as well, as you demonstrated in your example. For the record, I would have thought that tweet to be hilarious, but when you are speaking person to person, sometimes it’s hard to know where their line is. I sympathize. As far as writing for a broader audience, the best advice I can give about making sure your humor isn’t hurtful is this: Humor can be an exchange of power, so the target should have power to spare. That’s why someone like Donald Trump is a fair target—the power exchange won’t harm him. But targeting someone with little to no power, or less power than the one telling the joke—people who are already marginalized—may get laughs, but at the cost of those whom can little afford it. Consider who, if anyone, may lose power for those laughs, and if they can afford it. I think subversive, sarcastic, wry, and biting humor is great, as long as it fits the character and isn’t punching down. I love your advice about the exchange of power. That’s a really helpful thing to have in mind, not just in writing, but in life! Welcome to this morning’s edition of Wake Up Your Kid. Ben’s mom enters his bedroom, which is completely dark. Her next move requires two important skills: a great amount of dexterity to reach the light switch, and memory so she doesn’t knock over the pile of books that’s next to switch. She’s stretching, stretching…she’s got it! And the room is flooded with light. Ooooooh! What an obstacle course before her. She surveys the scene. You can see the wheels turning in her head as she strategizes. She must navigate through the minefield of toys, shoes, and dirty laundry without tripping or stepping on anything hazardous. She glances briefly at the empty hamper and shakes her head. Watch out for stray Legos. Those can do quite a lot of damage. That blanket fort is going to be tricky as well. You never know what might be lurking inside it. Ok, she’s made it to the first bare spot of floor. Now she’s got her arms out at her side as she regains her balance. The oscillating fan will be a challenge. On one side is a K’nex structure and on the other is the bed. If she loses her balance and falls onto the bed, she’ll wake up Ben prematurely and he’ll be grumpy all day. If she falls into the K’nex structure, she’ll destroy it and…Well, let’s not even go there. Everything is quiet now, except for the swish of the fan, as she bends around it…and…she slides a foot forward…careful of that Nerf gun poking out from under the bed… The anticipation is palpable…She places one hand on the bed…and she eases herself down…Yes! She’s done it! She’s gently nudging Ben awake. He sits up, smiles, and hugs his mother. Another successful mom with a happy child. Haha! This room description is wonderful! I love the details you added with the perilous K’nex structure and the Nerf gun poking our from under the bed. I think you could make it even funnier with a bit of specificity, and maybe even hyperbole, with the items mentioned. For example, perhaps you could have a loaded Nerf Zombie Strike Dominator Blaster, or something of the like. (That’s a real thing! I just looked it up!) Play around with that and see what happens. Thanks for sharing! Whoops! I’m still in Wednesdays Q & A mode. I’m sorry! I will get right on that writing assignment and into the correct day! Hahaha! I loved how you referred to the people by their mugs, and that twist ending cracked me up! This is great. Sunshine: Wasn’t that the opening line of a hit song from the seventies? Mary: You tell me. I’m not that old. Sunshine: Never mind. In mere seconds, Maggie’s first alarm will go off. As most fans know, Maggie sets two every night. Mary: And there’s the first one! It’s her cell phone, singing the traditional Apple wake-up song. Not pleasant, as alarms go. Sunshine: Wow, Maggie must be sleeping hard. She’s barely stirring. Mary: Wait! I think her foot twitched. Sunshine: Watch closely, folks. Clearly, she’s starting to register the sound. She’s burrowing deeper under her pillow. Mary: Now her hand has snaked out from under the blankets and is reaching toward the night table. You can see her patting the table, feeling for the phone. She’s getting warmer … she’s got it! Sunshine: Watch this expert motion. Maggie is a master at this. While the rest of her body remains cocooned in bed, she uses her one exposed hand to cradle the phone and swipe her thumb across it, setting it to snooze. Mary: Aaaaand now the second alarm goes off. Sunshine: This one’s obnoxious, folks. A loud, insistent BEEEEP BEEEEEP. Mary: Maggie is up for the challenge. Her hand is right there. A quick smackdown, and the cacophony stops. She’s effectively bought herself ten more minutes in dreamtown. Sunshine. Whoa! Listen to her sawing logs. It’s as though those alarms never went off at all. Hee! It’s like you were in my room this morning. I love the wordplay on “smackdown” and the mental image of Maggie fumbling for her phone, without cracking an eye. One suggestion that might up the humor: perhaps you could describe Maggie, using exaggeration. For example, matted hair, dried drool on her face and pillow, the remnants of yesterday’s mascara could all be discussed to great comedic effect. Great suggestion! However, I’m not sure the matted hair, dried drool, and mascara remnants qualify as hyperbole! I had fun writing about my breakfast as if I were a sports commentator. I bet my students would enjoy this prompt! Her stomach rumbling, she is finally ready to make her breakfast! She hustles into the kitchen, opening that refrigerator door with flourish, and jumps up and down to see her favorite plain greek yogurt sitting on that second shelf. Plain greek yogurt? Could she be any more boring? How is she going to make that stuff taste good? The choice of the bowl is very important. Too big, and she might eat too much, too small and the toppings might fall all over the counter. She deliberates for a few seconds…what’s it going to be…a big bowl! Bold choice! I guess she doesn’t want to see her toppings cascading all over the floor. That is pretty messy and can take away from the overall yogurt experience. Especially that yogurt…BORING. The yogurt’s going into the bowl. One, two, three, four, five scoops. I will admit, in that big bowl, it doesn’t look like very much. Is she going to add more? She’s thinking about it…no, she decides not to. Hope she doesn’t regret that later. Lunch is several hours away. Now what toppings do you think she’s going to add to this yogurt? She’s opening the pantry, what’s it going to be? Something sweet? Something crunchy? Sweet! She starts by adding honey, a crowd favorite. A bold but solid pick. A little drizzle, she mixes it into the yogurt. I can tell this yogurt is going to be better already! She’s going back into the pantry. What’s it going to be this time…crunchy! She is adding Grape Nuts cereal. You know, I never did like it much as an actual cereal–tastes like dog food when you put it with milk–but it is an excellent yogurt topping. I can tell this is an old standby for her. She’s probably been pairing yogurt and Grape Nuts for years. Yes, look at that look of satisfaction on her face. Now this is looking like breakfast! Wait…she’s heading back into the refrigerator. She pulls out one, two! different types of fruit: raspberries and blackberries. Are they going into the yogurt or will they go on the side. The crowd holds its breath as she washes them….the go into the bowl! She is mixing them into the yogurt. And a small glass of milk completes the breakfast. Wow. Now this is a breakfast of champions. No way will she go hungry. And the crowd goes wild with each crunch of those Grape Nuts. Delicious! “A bold but solid pick.” sounds very sports castery. Fun! I liked that part too! Great voice. I loved how you started with a rumbling stomach. It was like the revving of engines. Is there a way you could work a reversal of expectations in here? Perhaps by giving that healthy breakfast to someone else, and then the character gives herself a donut or something? Could make for a nice twist (a maple twist?) at the end. Thank you for the lesson on humor and the writing prompt for today. I had so much fun reenacting the activity of bike riding, which happens on a daily basis. I’m working on a chapter book in which the main character is a nine-year-old boy. I have enjoyed writing with “nine-year-old boy humor” because it is undoubtedly unique and different than middle school or high school humor (although, depending on the maturity of the middle school or high school student, it can be quite similar☺). Ladies and Gentleman, the helmets have been strapped on and the pedals are lubed up and ready for action. Both racers take off at the same time, but Avery has the commanding lead going into the first turn. “Car!” Avery yells and the race comes to an abrupt and unexpected halt. Fiona, the rookie driver, is wobbling a bit but seems to have planted her feet on the asphalt before an early accident occurs. She waves to the passerby and wobbles again. She needs to really concentrate if she has any chance against the experienced rider, Avery. The lead race official must walk out onto the track to help the riders get back to the finish line. Avery attempts to help, but Fiona states that she can do it. “Okay, all clear, go!” Signals the race official and the racers are off again. This time they both make it around the first curve. It seems as though the wind is blowing Fiona around the course a bit (she is struggling to drive in a straight path). Wait, there’s no wind. She straightens it out into the second turn and seems to no longer be racing as her speed has lessened to more of a turtle’s pace. Avery’s Mach five speed is on display as she has passed Fiona for a third time in just five laps. Fiona begins smiling and laughing to herself as she slows to a complete stop. Is she out of gas? “Oops, I just farted while I was pedaling.” She proclaims. Nope, she’s not out of gas, but it looks like her concentration is shot as she walks her bike into the pit stop. Avery takes a victory lap begging her competition to come back out for another race. I laughed out loud at this part: “’Car!’ Avery yells and the race comes to an abrupt and unexpected halt.” Such a true detail, and made funny juxtaposed with the seriousness of race commentary. Great twist at the end as well. As with some of the other examples, I think some specificity could help to make things even funnier. Perhaps you could be more specific about what kinds of bikes they are riding? Could be a good place for incongruity as well. Offer some description, like pink, with a white basket and streamers, but with flames painted up the sides.